5 W. Ontario St., Chicago, IL 60654 and many others... check out http://www.mburgerchicago.com/index.html#location2 for other locations! When I think of M Burger, I remember my favorite burger place on the West Coast... the famous In-N-Out Burger. M Burger also focuses on simplicity, thus offering just simple burger options. Recently they have added a couple of the "secret menu items" to their regular menu, like the Hurt Burger. Just make sure to ask them about the rest of the secret items. They are all delicious I just wish it wasn't as greasy and also that they had a better sit down restaurant atmosphere. Also, the cost is a little pricey for fast-food places in Chicago. Somehow though, this place keeps sucking me back more and more times... probably meaning that it is better than a 3.5 mile rating. I will keep it here for now, but who knows, after eating it a few more times it may be increased. 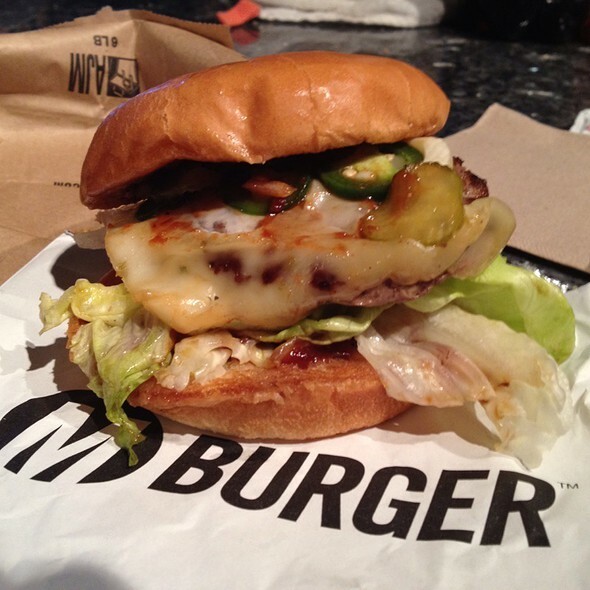 An extremely juicy burger topped with pepper jack cheese, spicy BBQ sauce, jalapeños, green chilies, lettuce and tomato. It has a nice spice and a nice little after burn! They have different degrees to spiciness with the 3rd degree being the hottest. Other less spicy degrees just have less of the additional toppings that I mentioned above. This is the most similar burger joint to the famous in n out! A Must try! The special for the day on their "secret menu." 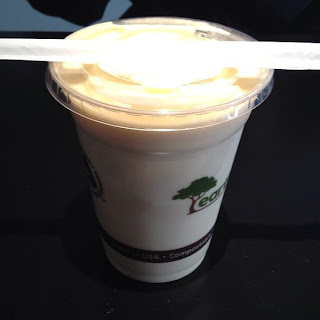 The shake was more like a vanilla milkshake with a slight mango hint. 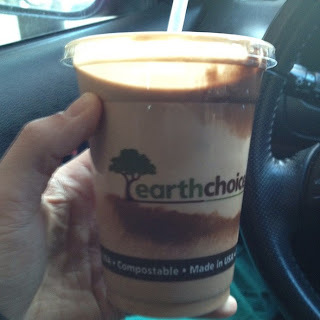 It was extremely creamy and definitely a great milkshake for a hot summer day. Overall, I enjoyed it but wished for more mango still. This was the special on one of my visits to M Burger. These "secret menu items" need to be requested by the customer so make sure to ask! I was extremely excited to see chocolate fudge especially because of my huge sweet tooth. The milkshake was extremely creamy, but was melted just enough to be easily drank through a straw. The chocolate fudge was so rich... in fact, it was too chocolatey for my friends to enjoy... BUT I loved it! Make sure to have some fries or a burger because the saltiness is a great contrast to such a rich and sweet milkshake. - Make sure to ask for secret menu items. They have different milkshakes each day including the amazing espresso milkshake (not pictured). They also have different combinations like the "Dr. Betty" which is a nurse betty (on regular menu) with a hamburger patty. It is delicious because of all the fresh veggies and the special sauce. - Do order their fries... They are always freshly fried and enjoyable to eat. - I wouldn't plan on eating at the restaurant... Most of the places are real small with a handful of seats. The lines can get outrageous during lunch hour so I would order out and take it back to a more comfortable place to eat. The chocolate fudge shake sounds good with M Burger's wholesale process meat suppliers melbourne array of meat burger patties. From Australian lamb to Ostrich burgers.